This week was a long one. Thank goodness it's over and time for Book Club Friday!! I have mixed feelings about this one. From the cover quotes and blurb, I was expecting a laugh-out-loud read. While there were a few occasions where I smiled, at no point did it make me giggle. In fact, it took me longer than usual to finish this one because it made me feel anxious. Anxious and self-conscious. Rachel is a self-help guru whose first book about quitting smoking becomes a best seller. With the help of her long-time shrink, Dr. Ness, she manages to ban all bad lifestyle choices. No drinking, no sugar, no carbs. After being with Dr. Ness for a while, she whittles down from 160lbs to 128lbs. This is where we started to fight. Mostly because Rachel became a mega-cranky character. Yeah, I feel hunger too…and then I EAT SOMETHING! Being a counselor myself, I was appalled with the dialogue between Rachel and Dr. Ness. Talk about a co-dependent and toxic relationship. They’re both so consumed with being thin that it completely monopolizes both of their lives. 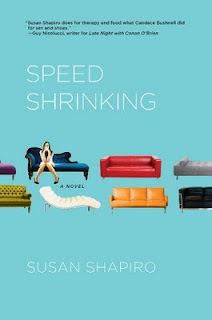 The back blurb of Speed Shrinking suggests that Rachel spends a lot of time speed-dating shrinks to replace Dr. Ness when he moves out of the city but that’s not what happens at all! It all takes place in one chapter and was over almost as quickly as it started. Reading about how paranoid Rachel is in her size 12 jeans wasn’t enough to keep me engaged. She’s a seriously neurotic character and although I kind of wanted her to get over herself, I wasn’t super invested. I mean, at one point she goes to an institute for over eaters. An INSTITUTE! She’s not even overweight! Her height is mentioned in the beginning and even at her “grossly fat” 160lbs, she’s still considered healthy according to the BMI. The worst part, though, was Rachel’s reason for freaking out about her weight gain: she’s set to have a new book published about overcoming food addiction. I think the author thought this would be enough tension to keep the pace up but it fell flat for me. As in real life, I hate inauthentic people and unfortunately, Rachel falls into this category. Being an average-sized woman, I couldn’t relate to Rachel’s plight. Her constant reliance on external validation left me thinking she was 22 instead of 38. So, I have to say that I can’t really recommend this one. Bummer because I liked the premise but Rachel and I just didn’t see eye-to-eye. Thank goodness I got this one on clearance. It's listed for $23.99 on Amazon right now. I totally got hungry reading the description of this book. A possible real over eater. PS I'm pregnant so it's cool. No therapy needed. I dont like books with single women in their 30s who dont have their shiz together. I dont know why, it just bugs me. By thirty, you should have it together :) And $23.99, no thanks. I love your reviews though, because it is usually about a book I havent yet heard of!! Haha, love your review, you are funny! Man, the constant emphasis on women losing weight is so oppressive! UGH. I'll be skipping this one thanks to your review. :) I'm reading The Help right now and loving it!